On the surface, baseball’s marketplace for talent seem to be shrinking in recent years. Much ado was made of last year’s round of free agency, with many prized players signing very late. Scan through transaction lists for the last few years of free agency and the trade deadline, and it seems as if there’s a finite and decreasing number of stars who change hands via the market, either through free agency, in-season trade, or offseason trade. The perception has been that major league clubs are doing a better job of locking up their young stars, buying them out through their arbitration years and multiple years of free agency. Let’s put this theory to the test. 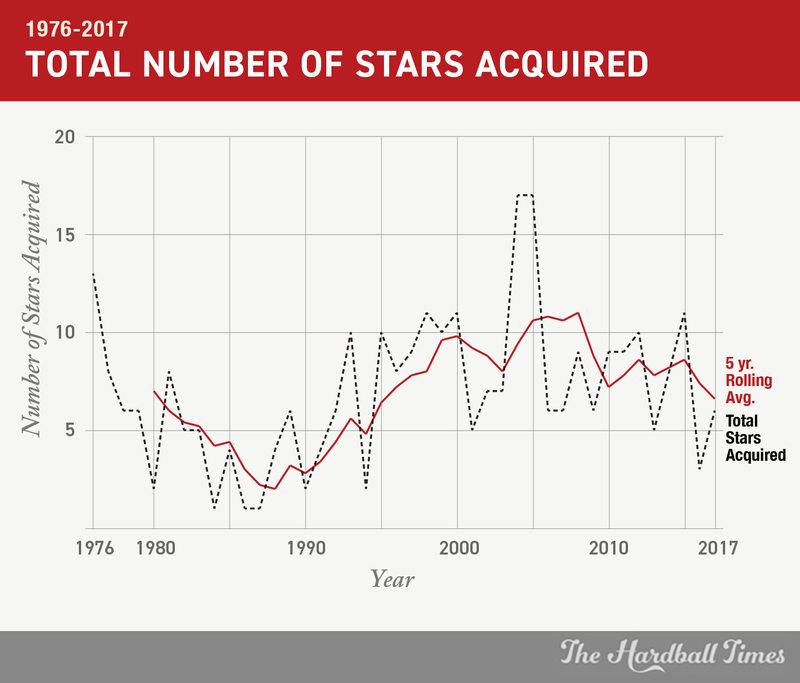 How have most stars been acquired historically? 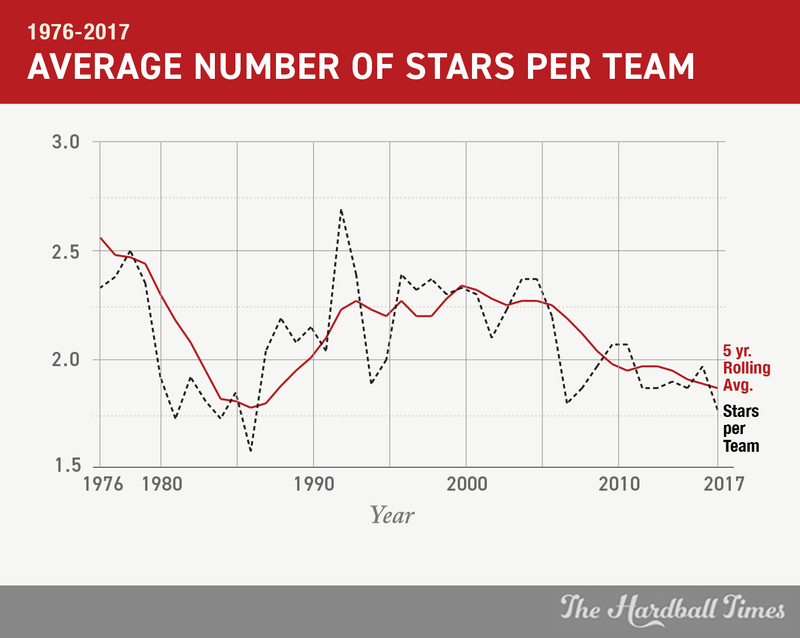 Are there fewer stars per team per year? Is it harder to acquire stars now than in previous years? Before going further, we need a good working definition of a star. The FanGraphs glossary page for WAR (henceforth referred to as fWAR) includes a rule of thumb chart that lists 5.0 fWAR as the upper end of the All-Star category, with anything above that a Superstar or MVP-quality player. That sounds like a great starting place. We’ll include any player with 5.0 fWAR or more in a single season. However, there is also a lot to be said for consistently good production over multiple seasons, even if it occasionally falls short of a single season at or above 5.0 fWAR. For that reason, I’m going to include all players with 9.0+ total fWAR over a two-year span, and 12.0+ total fWAR over a three-year span. These parameters will give us a group complete with future Hall of Famers (for instance, Albert Pujols), annual All-Stars (Dale Murphy), players in the prime of a well-above-average two- or three-year burst (Troy Glaus), and one-year wonders with good careers who reached star status for only a single season (Terry Kennedy). For time frame, we want to include a period that covers most of the typical modern means of acquiring players. The draft started in 1965, but it was several years before major league rosters truly felt the impact. Similarly, free agency as we know it wasn’t around until 1976. That being the case, our data will begin in 1976. Or rather, for individual players, we’ll look at their three-year fWAR beginning from 1974 to 1976. Using those parameters, we can collect all our star-quality players and determine if they were acquired via free agency, trade, in-season trade, draft, minor league free agency (signed as minor league free agents), or minor league trade (acquired before becoming even semi-regulars at the major league level). For fWAR in 1981, 1994 and 1995 – baseball’s incomplete seasons – I’ve prorated fWAR out to a full 162-game season. Players classified as having been acquired in the draft include those who were Rule 5 draftees and international signings. It also includes players acquired before the draft existed but still playing at a star level with their original organization. With all our parameters in place, we now can get started. How Many Star Players Are on Major League Rosters by Season? We’ll begin with a rather simple approach. How many players qualify as stars each season? I’ve included the number of actual stars per season, as well as a rolling five year average to smooth things out. Here’s how that looks. A few trends stand out. First, we see a massive decline in the early 1980s. It happens that the early-to-mid 1980s were the peak of modern-era small ball. League-wide, teams were routinely attempting a stolen base on approximately three percent of all plate appearances, and frequently at inappropriate success rates. For comparison, the rate of stolen base attempts per plate appearance hasn’t been over 2.5 percent in the 21st century. It hasn’t been over two percent since 2014. Moreover, teams were bunting much more frequently. The rate of sacrifice hits per plate appearance was steadily above 0.9 percent into the early 1990s, with the highest figures falling around 1.18 to 1.21 percent, mostly in the early 1980s. Today, it floats around 0.5-0.6 percent. Compounding all of this, teams frequently sacrificed extra-base pop and walks for the types of players who fit the small-ball schematic. From 1978 to 1986, major league-wide slugging percentage never cracked .400. By comparison, only three seasons since 1993 have fallen below .400. The focus on speed in place of power sapped players of the type of value that would allow them to crack 5.0 fWAR in a season, or 9.0 fWAR in two seasons, or 12.0 in three seasons. They excelled at skills that simply aren’t as valuable by modern metrics. It’s also impossible not to notice the boost during the steroid era. The precise years of the steroid era are hard to pinpoint, but there’s little doubt the mid-to-late 1990s fall in that range. There’s a sizable boost on our graph during that era. Additionally, there’s a significant dive during the research phase of the Mitchell Report as well as in the wake of its release. 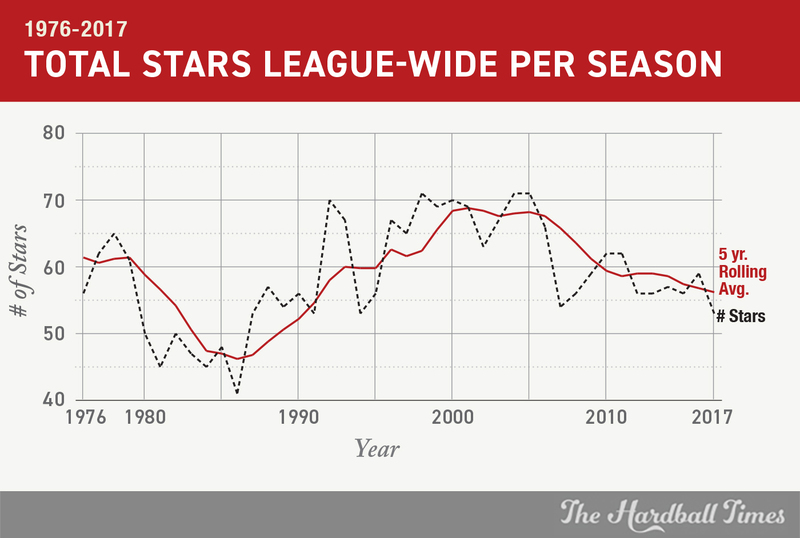 More recently, the number of stars per season seems to have stabilized closer to late-1970s and early-1990s levels. Since 1976, there have been three rounds of expansion. That creates competition for the services of this class of player. It’s a lot easier to have two or three star players when you’re one of only 24 teams compared to one of 30. Here’s how the average number of stars per team translates in our sample. I’ve included both a year-by-year line and a five-year rolling average. There’s been a slight decline in stars in recent years. The rolling five-year average for the last eight seasons has been under two stars per team. The only other seasons with under two stars per team in the sample are 1983 to 1989. One possible reason for the current downturn could be that fewer starting pitchers are amassing enough innings to reach 5.0 fWAR, meaning the pool for potential star players has been diminished. The 2017 season included just 15 pitchers with the star designation, the lowest total since 1995. Pitchers haven’t gotten worse, of course. They simply aren’t pitching as many innings as they once did. How Are Star Players Acquired? The best starting place is to split the types of acquisitions into three groups. The first is fairly straightforward: free agent signings. The second includes two types of trade acquisitions, both in-season and offseason. And finally, the remaining group includes all other types of acquisitions. This means stars who were drafted by the organization they played for, stars who were acquired via trade when they were minor leaguers, and stars who were originally acquired as minor league free agents. The vast majority of this category is made up of players who became stars after being drafted, but we can dive into that deeper momentarily. Before proceeding, I’d also like to clarify something. These are all star players, regardless of when they were acquired. For instance, for purposes of this graph, Pujols’ 2001-2011 seasons are categorized as “Drafted,” falling in the “Other” category. By contrast, his 2012 season as a star falls under the “Free Agent” category. That’s how he was acquired as a star during the 2012 season. 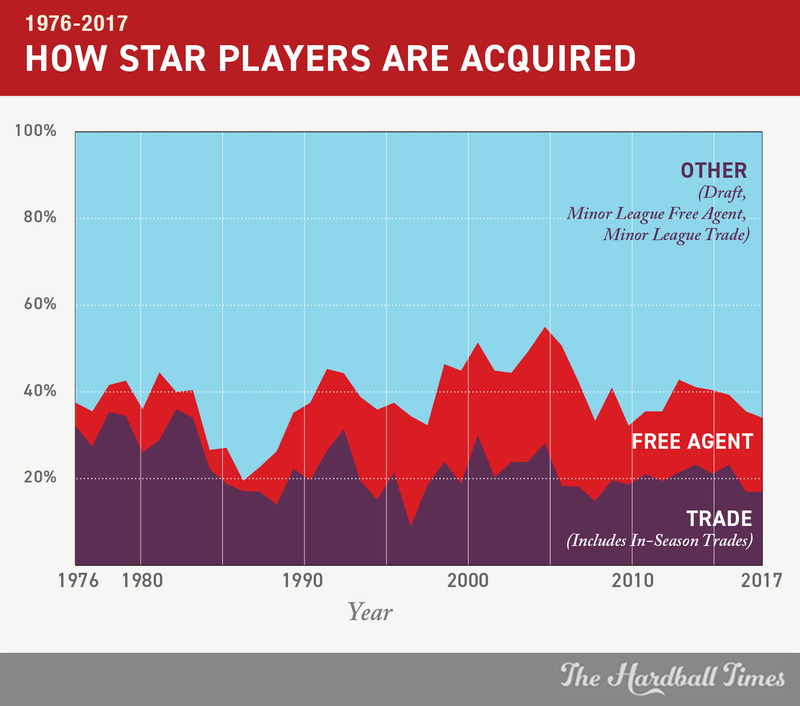 Here’s how star players have been acquired since 1976. There are a few smaller trends we can identify. The first is the sizable bite taken out of free agent stars following the 1981 strike, a trend that continued right up through the collusion years from 1985 to 1987. 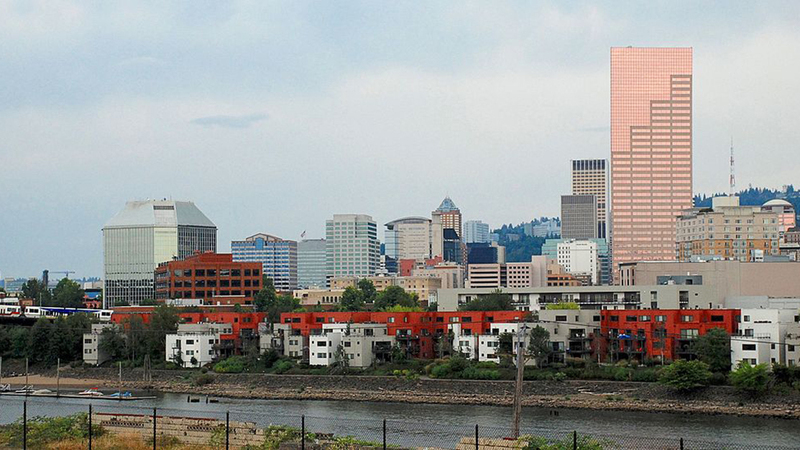 It thawed for a bit — even peaking around 1992 — before teams reached the uncertain years just before the 1994 strike, causing another free agent crater. Following the strike — and with revenue sharing taking on a stronger role — there were ample dollars to go around in free agency in the late 1990s through approximately 2005. Finally, we see the Moneyball era take hold around 2006 and 2007, with teams placing more scrutiny on the value of free agent excursions. Interestingly enough, with very few exceptions, the trade and draft trends tend to march in lockstep with one another. The most notable exception happened following the strike in 1994. From 1996 to 1998, the number of trades declined. This is likely a result of the delicate and complicated way the league had to approach salaries immediately following the strike. A spike in the number of free agents during those years meant teams didn’t need to execute as many trades to acquire star-quality players. How Many Star Players Change Teams by Season? We’ve established how many players perform like stars each season, and we’ve identified how those players were acquired by their teams. What we haven’t addressed yet is how frequently star players change teams. More importantly, we want to define these acquisitions as happening when they were considered star players. We’ll start with the raw number of stars changing hands by year, as well a smoothed out five-year rolling average to help with trends. Your eyes aren’t deceiving you. Only one star changed hands in 1984, 1986 and 1987. In 1984, it took an in-season trade of Rick Sutcliffe to avoid zero. Every other star-quality player stayed in place. In 1986 and 1987, it was Doyle Alexander and Doyle Alexander again (and Doyle Alexander a third time for good measure). His 1986 in-season trade to Toronto was the only time a star changed teams, followed by his 1987 free agent signing returning him to Atlanta, and yet another in-season trade to Detroit: the infamous John Smoltz trade. The Alexander note certainly is eccentric, but it combines with Sutcliffe in 1984 to underscore, once again, the effect collusion had on the open market for multiple seasons. There are a few other fascinating trends in this chart. The fact that the dawn of free agency in 1976 spooked owners into a more open trade market, both in-season and during the offseason, is interesting in its own right. Of the 13 stars changing teams that year, only one — Andy Messersmith– – was a free agent. But the fear of losing players to free agency apparently created quite a stir. The 2004-2005 spike is interesting, a delayed reaction to the 2002 Collective Bargaining Agreement that refined and increased revenue sharing. As for recent years, the perception of less freedom for star players to change teams is a mixed bag. It has trended down for a few years, but it comes on the heels of 2015, the most fluid season for star players changing teams since the 2004-2005 revenue sharing boom. It’s also a potential valley resting between 2015’s boom and a possible rally this offseason, with several star players slated for free agency. That said, the five-year rolling average for 2017 is 6.6 stars per year changing teams. That’s the lowest five-year average since 1995, the first season after the strike. It’s nowhere near as dire as it was during the collusion years, but if you’re in the market for a star player, it’s much harder to get them now than it has been in quite some time. We still need to address one of the original hypotheses. Namely, are teams getting better at signing their young, star players to long-term extensions, thereby suppressing the number of stars changing hands via free agency? Let’s look at how star players are acquired by year. Again, we’re focusing strictly on players who were already stars at the time of acquisition. This means we won’t need to bother with stars originally acquired as minor leaguers, signed as minor league free agents, or drafted. Here’s how it looks, including the number of players acquired via offseason trade, in-season trade, and free agency. Since these are fairly small numbers for some categories, this time, we’re using only five-year rolling averages. There’s that ’80s collusion yet again. The five-year rolling average for star free agents signed actually reached zero in 1986. Beyond that, we see both trades and free agent signings of stars saw boom periods from 1995 through approximately 2009. Then, in 2010, star free agent signings collapsed. Considering these are five-year rolling averages, that means the free agent situation started to dry out somewhere in 2005 or 2006. This is evidence of teams locking up their stars past their arbitration years, preventing them from reaching free agency until later. Of course, that concept wasn’t new in 2005. Cleveland famously executed the practice in the early 1990s, for instance. But it could be evidence that teams were beginning to better identify which of their own homegrown players to extend. Either way, there has certainly been a decline of available star free agents. On average, it has meant five to 10 fewer players over a five-year period compared to the 1996-2009 heyday. There has been a notable trend of in-season trades of stars over the last decade or so, peaking in 2012 and again in 2015, when five stars were traded midseason. It used to border on unthinkable to trade a star midseason. From 1977 to 1982, it happened only three times total. From 1984 to 1988, it happened four times total, and the same is true as late as 1990 to 1994. Now, it’s fairly commonplace. 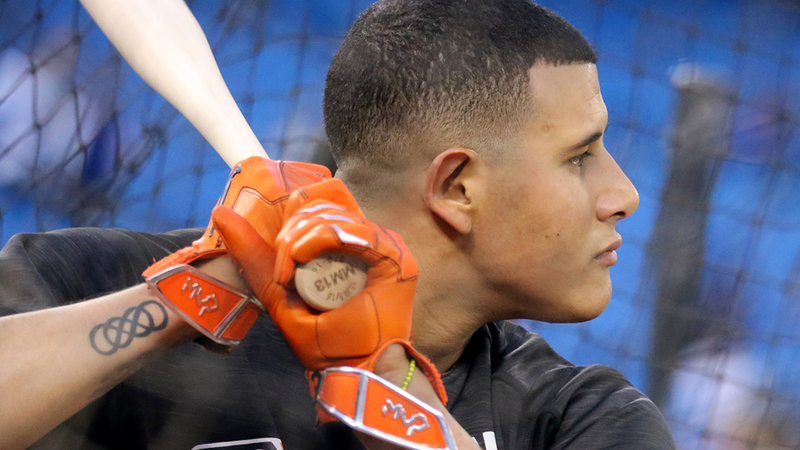 Manny Machado and Chris Archer were traded this year; it barely shocks anyone any more when trade deadline rumors swirl around players the quality of Bryce Harper. This is one significant way the game has changed over the last 10 to 15 years. We’ve seen there are fewer stars to go around over the last five to 10 years. This is most likely a result of the end of the steroid era, as well as a decrease in innings pitched for starting pitchers. At this point, there are approximately 1.8 stars per team, the lowest five-year average since 1987. In the last five to 10 years, we’ve seen an increasing percentage of players become stars after being acquired through the draft, with fewer and fewer having been acquired as free agents or even via trade. 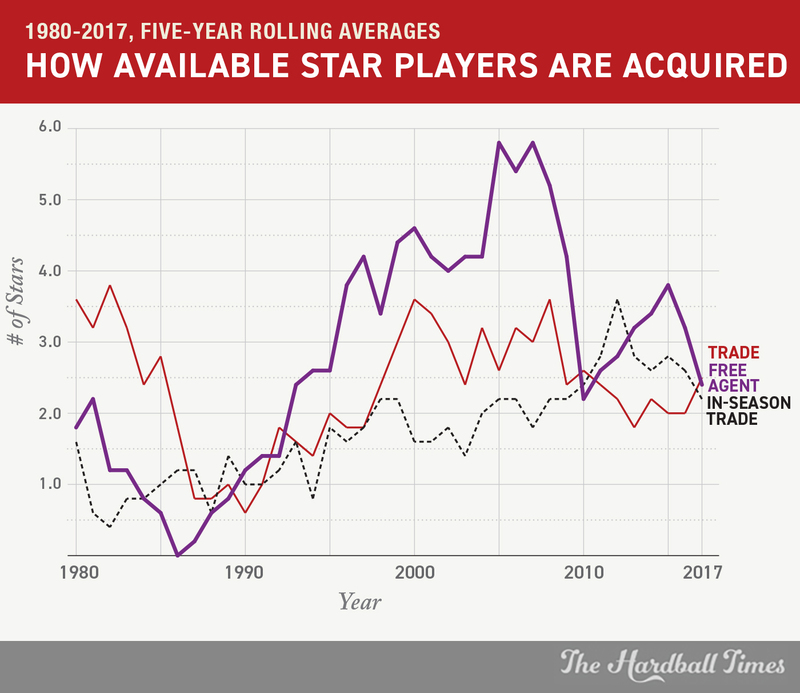 Over the last decade, the number of stars available via trade or free agency has slipped from over 10 per year to a five-year average of just 6.6 available per year in 2017. If you can’t draft or develop stars, your other avenues are much more limited than they have been in approximately 20 years. One avenue that has opened up more recently, however, is the in-season trade. Approximately one more star per year is now available for acquisition in the middle of a season. A great deal of this data works as evidence that teams are getting better at identifying their young stars, signing them to long-term deal past arbitration, and generally closing market inefficiencies. Nice job. However, your line graphs are not helpful to people who have trouble distinguishing colors (about 10% of men). In the future, can THT please do more to distinguish lines on graphs, such as varying width, making some lines dotted, etc.? This used to be part of our graphical standards. Hi, Dave. My sincere apologies for this. I’ve submitted new graphs using dotted lines and a thicker line, and we can get them swapped out. Really interesting article, and love the sound conclusion. Having trouble determining when some 1980s stars who were traded are on that chart however. Gary Carter was traded in December 1984. Was he overlooked, or was he included as part of the 4 in 1985? If 1985, what about John Tudor wo was traded in December of both 1983 and 1984? That’s correct- Carter was one of the four for 1985 (along with Blyleven, Buddy Bell, and Rickey Henderson), meaning those players were acquired for the 1985 season. Tudor (fun fact: I once went as John Tudor for Halloween in 1987) qualified as a star in 1985, but had not posted star-quality fWAR totals at the time he was traded. In other words, he only became a star after he was traded. I think it is not so much the difficulty to acquire but that teams don’t want to spend. You can get a controllable superstar like chris sale but this costs a 70 FV prospect (top5 overall), a 55 and more. teams could have gotten de grom for example but they were not willing to give up a guy like vlad jr and another top50 prospect. now a young player with 5 years of control is indeed almost impossible to acquire but a guy with 2-3 years is -if you want to pay for it. many teams don’t want to do that. I don’t see why steroids would influence the number of stars available. Even granting the “performance enhancing” effect of steroids, it should raise the performance level of the replacement player as well. It seems to me like the “number of stars” is really just a statement on parity from top to bottom across baseball, changes in which are interesting in themselves.